A cosy, Victorian cottage, recently renovated, nestling within the South Downs. Sleeps 2/3. King size bed. Bathroom with large, walk-in shower. 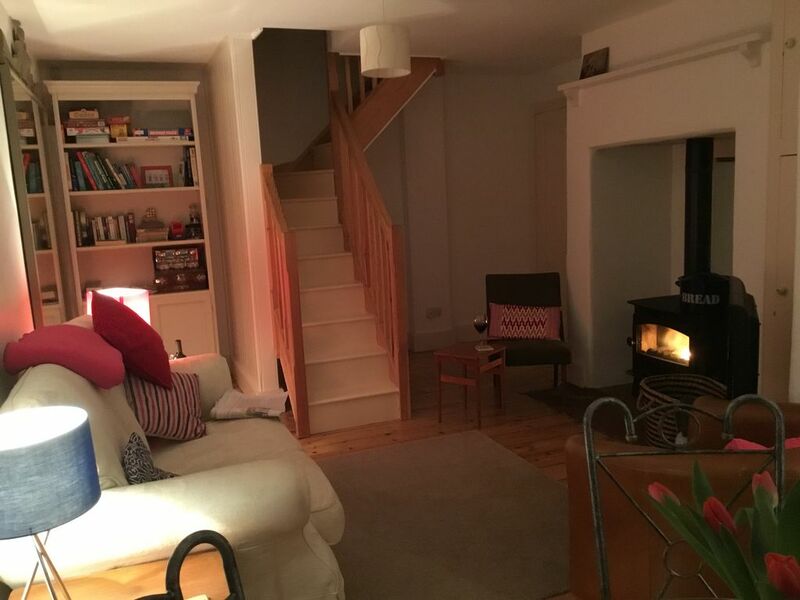 Private sitting room with flat screen TV & DVD player, log burning stove (logs/kindling are supplied for the first evening & available to buy at either of the two local stores thereafter) and dining area over-looking mature garden. Small kitchen equipped for light catering. Washing machine. Wi-fi. Ample, secure off road parking. Small outside courtyard perfect for breakfast. Beautiful walks along the River Itchen or on the South Downs on the doorstep. Shawford has it's own station making for easy day trips to London (approx. 65 mins) or the New Forest/South Coast (approx. 40 mins). Winchester, the ancient capital, is less than three miles away, - a four minute train ride - there you will find acclaimed restaurants (Rick Steins, River Cottage), plenty of old, historic pubs, pavement cafes, a buzzing High Street, live theatre..... alternatively stroll through the pretty back streets behind the magnificent Norman Cathedral to find Jane Austen's house and the Bishop's old Palace. If you enjoy walking, Winchester can be reached in around 40 minutes by following the path of the River Itchen which flows through the centre of Shawford. Shawford village has a local pub which serves good 'pub grub' and has a large beer garden. The Down House Cottage is attached to our family home, it has it's own separate front door and is entirely private although as it is attached there can be some occasional noise transference. Our family has two friendly labradors plus a cat. It is a non-smoking premises. Gas central heating with radiators. The cottage has it’s own thermostat so guests can control their heating. Bed linen and tea towels provided. Front loading washing machine in the kitchen. There is a small clothes airier for drying garments inside. Outside the cottage has it’s own clothes line with pegs. Plenty of parking available on the driveway. Bath and hand towels supplied in the bathroom. Logs & kindling are supplied for the first evening and can be purchased from either of the two local stores (approx. 1 mile away) thereafter. Two seater sofa, one leather armchair, one smaller upholstered chair. Occasional tables, TV with in-built DVD player. Dresser with books, games etc. Dining area overlooking garden. Small patio area directly outside the door to the cottage with garden table and two chairs. The cottage is ideal for short stays. It’s a great location for discovering the South of England or simply getting to know Winchester, one of it’s most historic towns which is less than three miles away. Very conveniently located and comfortable property. The gardens were a particularly delightful surprise. Comfy bed and plenty hot water. Could perhaps have more storage space in the kitchen but we don’t go on holiday to do a lot of home cooking. Fantastic stay. Beautiful rural setting, yet only minutes by train to Winchester. Sue was welcoming and nothing was too much trouble, yet she was also discreet and let us have our privacy. Susan made us feel really welcome, and was attentive and responsive throughout our week’s stay. The cottage has huge character and is located conveniently near the Itchen Navigation offering waterside walks into Southampton or Winchester. It’s brill too for the Station so that you can pop into Winchester, Southampton or elsewhere and not worry about drink driving! Beautifully presented cottage with good connections for exploring the wider area. We stayed here while visiting our son in Southampton. The accomodation was well presented and equipped and wonderfully warm. Sue was very welcoming, and left milk for us to brew up on arrival - thank you! The location is good for visiting Winchester, Southampton, Portsmouth etc, but also great for walking from the door in the Itchen valley. We would certainly stay here again when visiting locally. Three weeks at The Down House Cottage was the perfect place to be based for day trips around the area. Our hosts, Sue and Tim, were helpful and thoughtful but also left us to our own planning and schedule. The cottage was very comfortable, spacious and well cared for. The grounds were lovely and parking was perfect. What more would anyone need? We arrived early and Sue allowed us to park the car and deposit our luggage although the cottage was not completely ready. We then took the very convenient bus into Winchester. Bus stop 5 minutes walk away and several buses, service no 1, run each hour between Winchester and Southampton. The railway station also 5 minutes walk away for trains to London, Southampton or Portsmouth and the motorway runs alongside the village, the constant hum from all the transport services might be a problem for some. The cottage was very clean and comfortable and had everything we needed except perhaps for an icebox in the fridge for our picnic ice packs. There is also no microwave which for us was not a problem at all. The patio was great for al fresco dining. We were there during an exceptionally hot week and we took advantage of breakfasting in the sun and relaxing in the shade in the evening. The area makes a good centre for touring and visiting attractions. We visited many gardens, the most stunning being the West Dene gardens between Petersfield & Chichester. We also had a great day out on the train to the Portsmouth Historic dockyard and the amazing new museum of the Mary Rose. Winchester has much history and culture to share, the cathedral is particularly interesting. There is also a very enjoyable walk, a fairly easy 4 miles, from the lane next to the property or the footpath below the railway station, which mainly follows the River Itchen all the way into Winchester. Thank you Sue for helping to make our week enjoyable and memorable. An additional guest can be accommodated in a single bed (separate bedroom) - cost per night £25.